A New Suburb For Ealing? The prospect of creating a completely new suburb based at the disused land of RAF Northolt was one of the ideas raised at a summit of local experts last week. 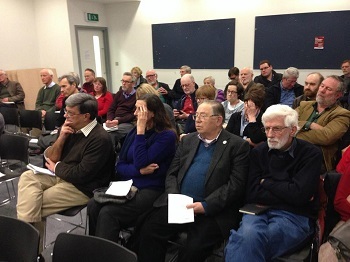 Councillors, civic society members and members of local residents associations turned out to Ealing Library in force on Saturday (25th January) for the first of 2014’s Local History talk series. 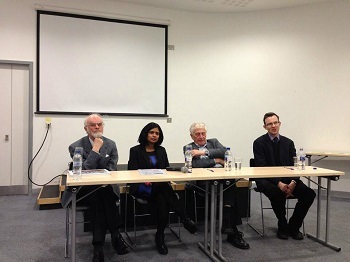 Speakers included the eminent urban planner Prof Sir Peter Hall, author of Jonathan Carr’s Bedford Park, Dr David Budworth MBE and Labour's candidate for Ealing Central and Acton, academic, Dr Rupa Huq. Dr David Budworth MBE, began proceedings with a talk evaluating the merits and demerits of Bedford Park in relation to both the garden city principles of Ebeneezer Howard and its long rival Hampstead Garden Suburb. Original plans were presented with the stated founding aims of being for modest pockets and of aesthetic value. The eminent urban planner, Professor Sir Peter Hall, a long-standing resident in the borough described Ealing as the “ideal urban form” as he began with an overview of suburbia before speculating on where new suburbs might be sited as the UK population continues to increase. Given the protection of the Greenbelt one solution he proposed was to build housing on the vast acreage of the much underused RAF Northolt. The former Deputy Mayoress for Ealing, and Labour's candidate for Ealing Central and Acton, author Dr Rupa Huq made a passionate defence of Ealing’s cultural history. Calling upon research for her recent books – ‘On the Edge’ and ‘Making Sense of Suburbia Through Popular Culture’ – she criticised what she called “urban elitists who label suburban dwellers as a bunch of ‘net curtain twitchers”. “I’ve lived and worked in the area for most of my life, so of course I love any opportunity to talk about the area’s amazing cultural history with other people who have lived here too. She went on to issue a stark warning against Government neglect of suburbs like Ealing adding they deserve much-needed government support if they are to remain as relevant in 100 years as they are now. The popular talk ended with a Q and A with library staff having to call time on a lively and wide ranging discussion. Were you there? Did you agree with the speakers? Would RAF Northolt be a good idea for a new suburb?